We are glad to share with sims community our motion software. 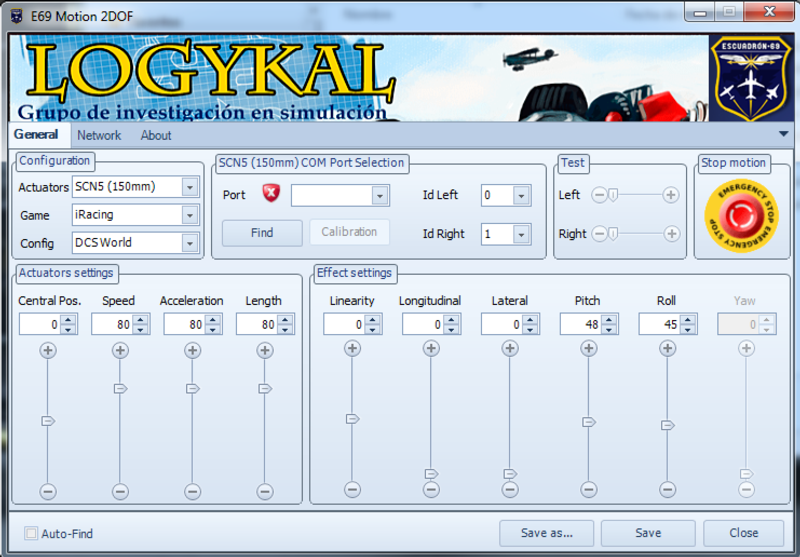 E69 Motion 2DOF is a free software program that provides a user-friendly and intuitive tool, for the operation of motion chassis. It can be used to build a low-cost yet high-quality chassis for flight and racing simulators. It consists of a GUI in charge of the configuration, calibration and running-up of the motion system. Operation is very simple: select your actuator COM ports, complete the calibration, configure the actuator motion, configure the feel motion and off you go! I present my rendition of Sandown Raceway based on the way it was presented for the V8 Supercar Championship round in 2012. The track has been scratch built using a combination of google earth images, personal experience, photos and onboard videos. Can't seem to be able to download this, keeps going to google docs. I'll just use this: http://www.x-sim.de/forum/viewtopic.php?f=44&t=58 But is there anything on seats? Wow awesome. I for sure am gonna try this out. Do you have any recommendations on the actuators and maybe other hardware/seat related information?